Next to Melbourne, Sydney is often scorned as lacking culture. Bright, touristic and the corporate hub of Australia, Sydney can seem hollow and lifeless to those who don’t know better. But for those who do know better, for those who can see past its shiny exterior, they will find a thriving hip-hop and rap music culture responsible for styling some of the freshest voices around today. 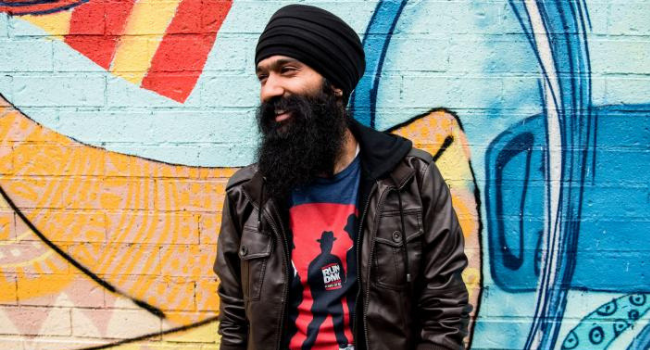 Having grown up as a resident of Western Sydney, L-FRESH the Lion, born Sukhdeep Singh Bhogal, stepped into the scene with a social consciousness and veracity that remains unmatched. With a strong focus on the high levels of racism and prejudice that remain prevalent all around the world, L-FRESH the Lion succeeds in utilising his platform as a way to speak out. Through thought-provoking lyrics, L-FRESH the Lion addresses issues of the world as he sees them, inspiring others to see the injustices as he does. L-FRESH the Lion introduced himself to the music scene of Australia in 2009. As he blazed his way through tracks inspired by the soulful hip-hop scene of the late-‘90s and early 2000’s, L-FRESH established himself as a force no one could contend with. His strong connection to his Sikhs from Punjab, India, created a distinct cultural voice to his music that guides his tracks in a way which is wholly fresh and unique. It is this unique voice that helped his debut album One, reach a new zenith in the Australian hip-hop community. L-FRESH has acted as a beacon of hope and change. In his early days as a young law graduate, there was a strong dedication to giving back to his community. He worked at the Asylum Seeker Resource Centre in Melbourne’s Footscray, and was pivotal in running a music program that helped young people integrate joyfully into the community. He is also Australia’s sole fellow in YouTube’s Creators For Change program, a global initiative that supports creators promoting awareness, tolerance and empathy on their YouTube channels. In 2016, L-FRESH followed up his debut album with ‘BECOME’. Singles such as Get Mine and 1 in 100,000 reached new levels of critical acclaim, setting a new high standard within the Australian music scene. These thought-provoking singles helped his follow-up album achieve a nomination for Best Urban Album at the 2016 ARIA Awards. This achievement, however, fails to truly indicate how far his voice and influence has reached. There is an undeniably personal desire to acknowledge the issues of the world in L-FRESH‘s lyrics. In 1 in 100,000, the melody and words are evocative, earnest, and passionate – stirring his audience to rise up with him. It directly acknowledges the struggles of marginalised communities and encourages them to find their inner strength. This is the music of a man who is determined to act as a beacon for people who have been shunned and tell the stories of those people who would otherwise have never have the chance. His passion and perseverance emanate through every lyric, every track and every moment. Currently, L-FRESH the Lion is about to embark on a tour around Australia as part of ET20: Celebrating 20 Years, which is set to debut at The Corner in Melbourne on November 9, before continuing on to The Valley Drive-In in Brisbane on November 17, and concluding at The Factory Theatre in Sydney on December 8. L-FRESH the Lion’s live performance promises to be an energetic and thought-provoking set you can’t miss. For more information or tickets on the event, head here.